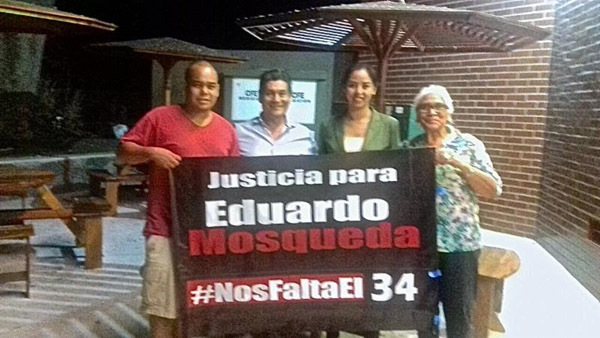 We are thrilled to report that Eduardo Arturo Mosqueda Sánchez, a young Mexican human rights and environmental lawyer, has been freed from detention. Eduardo has been imprisoned on bogus charges since July 22, when he was seized while working to defend the Nahua people in Jalisco State. A federal appellate court upheld a lower court's ruling that there is no evidence to support the indictment against Eduardo. The federal court nullified the indictment and took the additional unusual step of ordering Eduardo's immediate release. L to R: Eduardo, his father, Damaris Santana (IDEA attorney), and Dr. Raquel Gutiérrez Nájera celebrate Eduardo's release. Eduardo works for ELAW's partner organization, Instituto de Derecho Ambiental (IDEA), a grassroots organization in Guadalajara founded by award-winning attorney and long time ELAW partner Dr. Raquel Gutiérrez Nájera. Raquel wrote this morning: "Yesterday I relived the 22nd of July, 2015, when in the same room, the same official read the order for Eduardo's detention. This time, the order released him, and absolved him of any crime." Eduardo's arrest is tied to IDEA's work on a lengthy land dispute that the Nahua people, in Ayotitlán, Cuatitlán, have with an iron mining company (Consorcio Minero Benito Juárez Peña Colorada S.A.). In 2013, the community filed a constitutional petition known as an amparo asking the court to recognize the community's rights over the land. An administrative and labor judge from the 4th District issued an injunction, granting community members free access to all of the lands and suspending the mining company's use of the lands until the case is resolved. On July 22, Eduardo and hundreds of community members toured the contested lands. Some community members, including women and children, were assaulted, and 33 community members and Eduardo were detained. The community members were soon released, but Eduardo was held without bail for many months. "I am thrilled with Eduardo's release, but it is a grave injustice that he was imprisoned for almost 10 months on unfounded charges," said ELAW Executive Director Bern Johnson. "I hope the people responsible for this injustice will be held accountable."